In John Medina’s Brain Rules, rule #2 says, “The human brain evolved, too.” This chapter focuses on how our brains developed. One factor in that development was that our ancestors gave up on consistency. They didn’t have much choice; the changing environment slowly, steadily pushed them out of the trees and onto the grasslands. Instead of learning how to survive in just one or two ecological niches we took on the entire globe. Those unable to rapidly solve new problems or learn from mistakes didn’t survive long enough to pass on their genes. The net effect of this evolution was that we didn’t become stronger; we became smarter. We learn to grow our fangs not in the mouth it in the head. As Medina points out, learning to walk upright — something you can’t do in the trees — freed up our hands and was also energy-efficient, freeing energy to build and fuel our minds. The brain stem, or lizard brain, controlling basic functions like breathing, heart rate, sleeping. 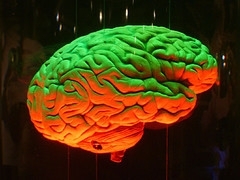 The cerebral cortex or the human brain, managing most of what we think of as higher reasoning. How did we manage this evolutionarily? We developed childhood. Much of our brainpower develops after birth, which means our survival depends on adults who can protect children. we had to learn how to cooperate. We can form impressions about the internal states of other people, something known as the theory of mind. Suppose you are not the biggest person on the block, but you have thousands of years to become one. What do you do? If you are an animal, the most straightforward approach is becoming physically bigger… but there is another way to double your biomass. It’s not by creating a body but by creating an ally. If you can establish cooperative agreements with some of your neighbors, you can double your power even if you do not personally told your strength. Another major trait we developed is the ability to reason symbolically. Here, too, we need time. Under the age of three, children don’t reason symbolically very well. Past that age, they can grasp and wield powerful human tools like language; they can reason; and they can deliberately set out to learn. Brain photo by jj_judes / Jude. Dave, itâ€™s curious what you say about humankind, that â€œwe took on the entire globeâ€?. You are so right. Some time ago I wrote a unit of science learning for year 9 students on how plants and animals adapt to their environment. I learnt that some living things are ubiquitous due to their adaptability. Pest it might be, the opossum is nevertheless a wonderful creature. It seems to be able to survive on just about any type of vegetation. This is much to the consternation of our conservationists here in New Zealand who want the creature eradicated on account of the damage it causes to the environment. There are many plants as well as animals that are adaptable like the opossum. Adaptability of humans, as you so brilliantly illuminated, lies in our ability to think. Stripped as when first born, we are vulnerable as lit candles in a draft. Yet our thinking skills, through the agency of tools, made us truly ubiquitous on earth. The ability to think, a feature that clearly must have been honed through evolution, is an adaptation that allows us to survive the most extreme environments â€“ think of a deep-sea diver, a firefighter, an explorer in the Antarctic or an astronaut. Obviously our adaptability isnâ€™t going to confine us to the globe. Ken, to make clear, “we took on the globe” was John Medina, not me. But I agree. As you say, one of his points is that most creatures adapted to their habitats — in some cases, so well that they can’t easily get out of the ecological corner they’ve painted themselves into. Koalas, if I recall, eat only certain eucalyptus leaves; pandas survive on particular kinds of bamboo. @Dave – thanks for pointing out that it was Medina – but you obviously found the right context for his words though. Yes, possums/opossums are native to Australia and were introduced by the New Zealand Government (believe it or not!) in the 1940’s for their fur and the sport of hunting them. They found their niche here in NZ! “Yum!”, they said, as they’d never tasted leaves like those of our native trees. They wiped out several prized species of plants, notably the native fuchsia which no longer grows in the bush but is preserved by a few dedicated horticulturalists. NZ fuchsia is like ice-cream to the possum!